Kitty Mama Drama | how's it going, eh? Sorry to post about Megumi again, but we’re having some serious kitty woes + I’m so worried y’all!!! 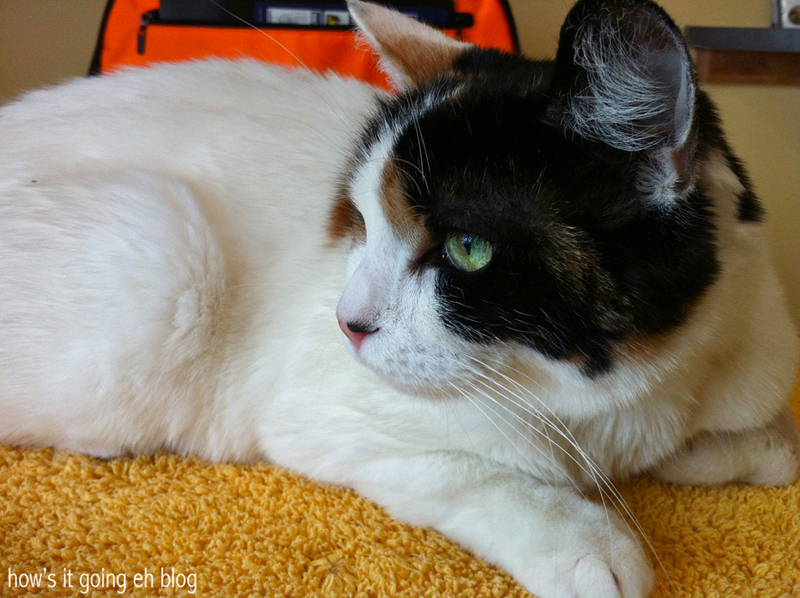 Don’t worry I’m not going to make this blog a cat chat blog – I swear! But my little loved one is still mysteriously ill! Nothing much has been going on out here in the country except for this kitty momma doing a lot of pacing around the apartment + wringing her hands in worry!!! As I posted on Monday, Megumi has not been eating. I took her to the emergency on Sunday. They gave her some appetite stimulant + she perked up for the day. By Tuesday, it was Downhill City. I mean, look at that face!!! That pretty pink little nose!!! Dog lovers, I know even YOU can’t resist!!! 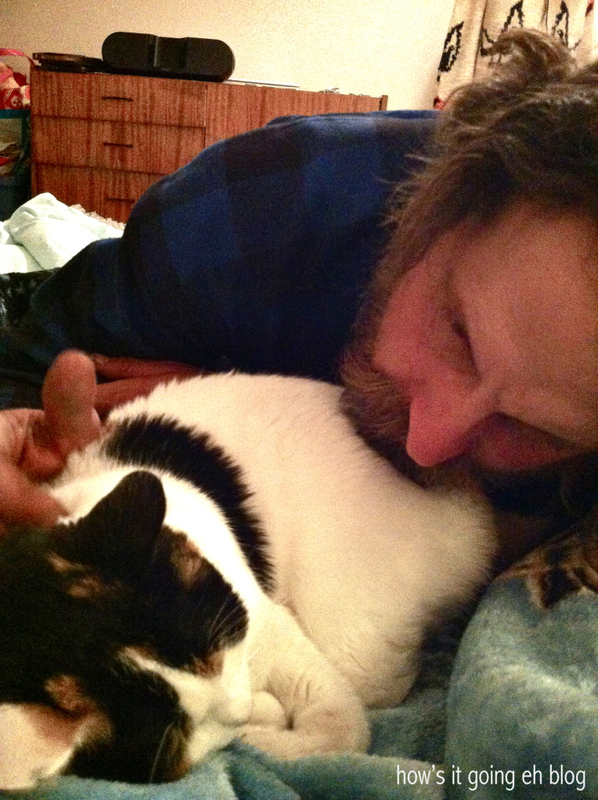 Because Jeff is allergic to cats, we don’t customarily let Megumi into the bedroom. But he has been so worried about his precious little lady (he’s become completely enamored with Megu – but tries to pretend no to be!) that he wants her be with us as much as possible. Who’s that?! What’s that noise?! I saw a shadow – someone comin’?!?!?! Poor thing. 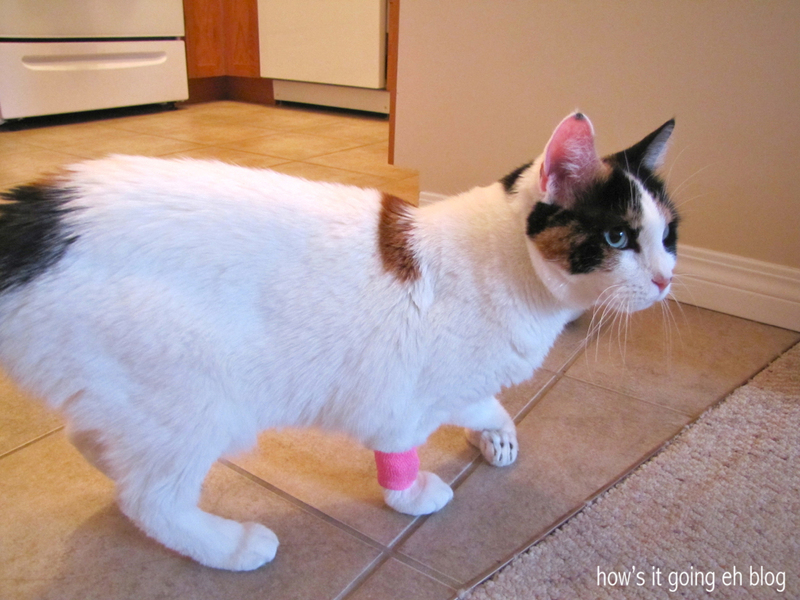 Between the emergency hospital + Eastern Slopes, her vitals are good, blood work is good + we sort of ruled out ulcers. What next? Well since she hadn’t been eating + drinking, dehydration was a major danger zone. Eastern Slopes put Megu on an IV drip + administered some X-rays to try + figure out what could possibly cause her to become so uncomfortable. I picked Megu up at around 8pm tonight after she had enough fluids back in her little body. Had a good long chat with the vet + the staff about her condition. 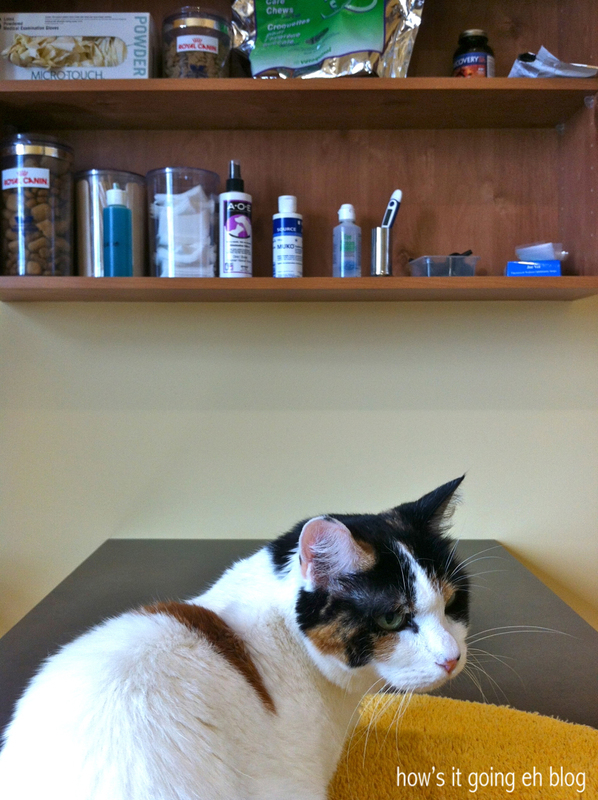 Possibly ulcers, stomach inflammation, worms – I was sent home with a lot of information, antibiotics, de-worming medicine + antacid. She has a catheter wrapped in a bandage to administer more fluids tomorrow. And it’s pink! Sassafras!! The vet staff repeatedly told me what a good, sweet, beautiful cat Megu was! Kitty Mom Pride! I am to take her in to the vet again tomorrow for more fluids. I gave her a smorgasbord of various foods to nosh on to her liking! 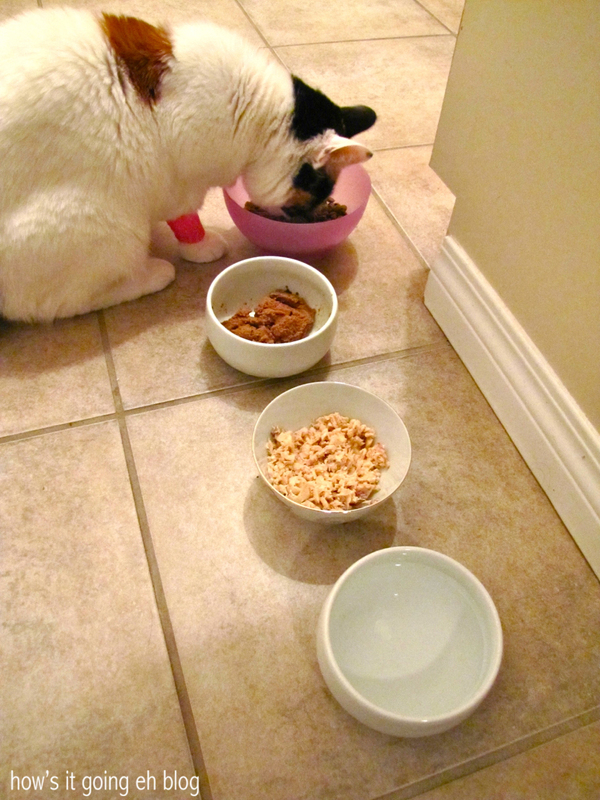 I offered her usual wet food, some dry food + I am testing out some salmon. By Zeus!!!! As I am writing she ate like two bites of dry food!!!! RIGHT ON!!!! Maybe it’s stress. She’s done a lot of traveling in the last year and now that you’re kind of “settled” her little body is releasing that. You know, kind of like when we push through long periods of work, holidays etc and then we catch a “flu” that puts us in bed for a week. Or maybe it’s the climate in Alberta (crazy). I have no idea, really. I sincerely hope she gets well soon!!! It could be – she gets really tense + is a nervous little lady. 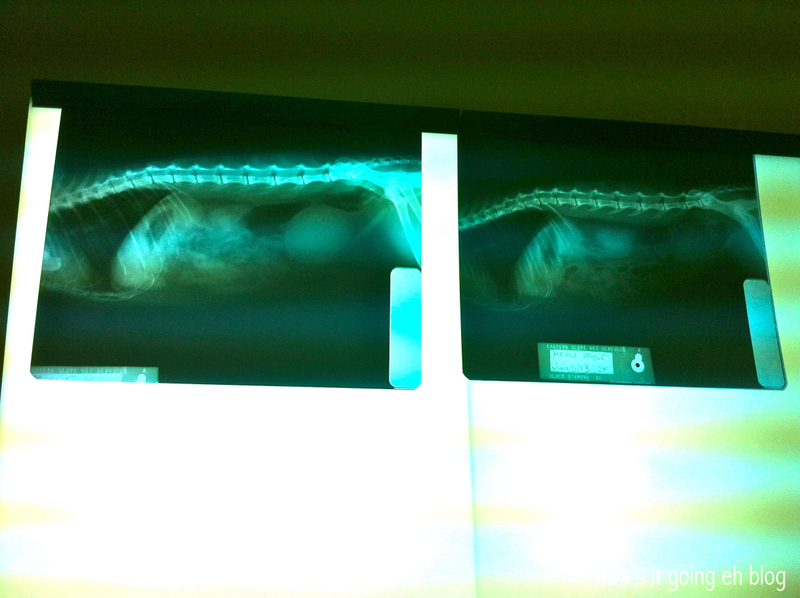 She had some air blockage in her intestines as shown in the X-rays. Thanks for all the well wishes!!! How’s your little kitty doing? Better, I hope. She’s doing better, thanks! I will do a post later today (finally)!!! Thanks for checking in with us Kim! Poor baby! It’s great that you found a good vet though! The BEST VET OFFICE EVER!!! I’ll keep you all updated! Thanks for the prayers! It’s all such a mystery! 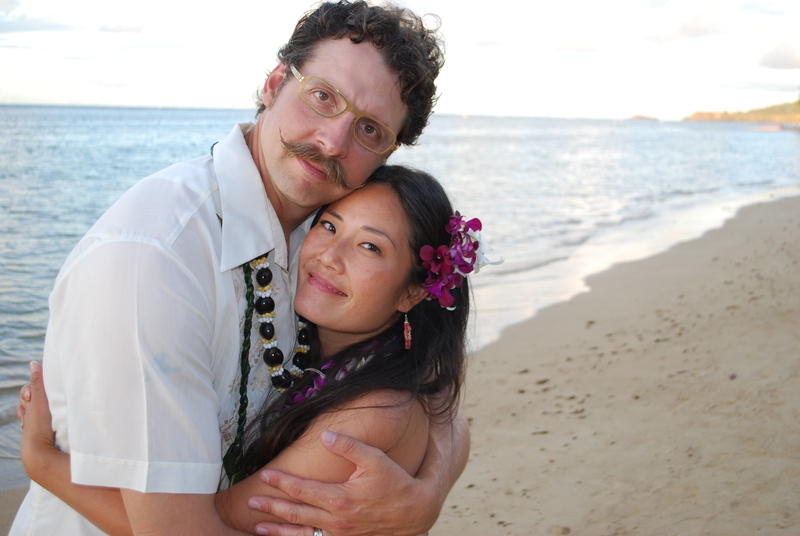 Oh poor Megu … poor you Shelli. Am thinking of you and sending you our healthy kitty love vibes your way. Poor little Megu. I know the feeling Shells, whenever our furry lady won’t eat, you gotta know something is WRONG! Poor little furry creatures, it seems like a hunger strike is their only way to tell their humans that they feel yucky. Yes! She won’t eat but when I hold her she still purrs like a little motor! I’m so sick with worry! Oh sweet Megumi! When I was visiting you in VANCOUVER , she was waiting for me by the door to say good morning. I pray God that she will get better soon and for your worry. 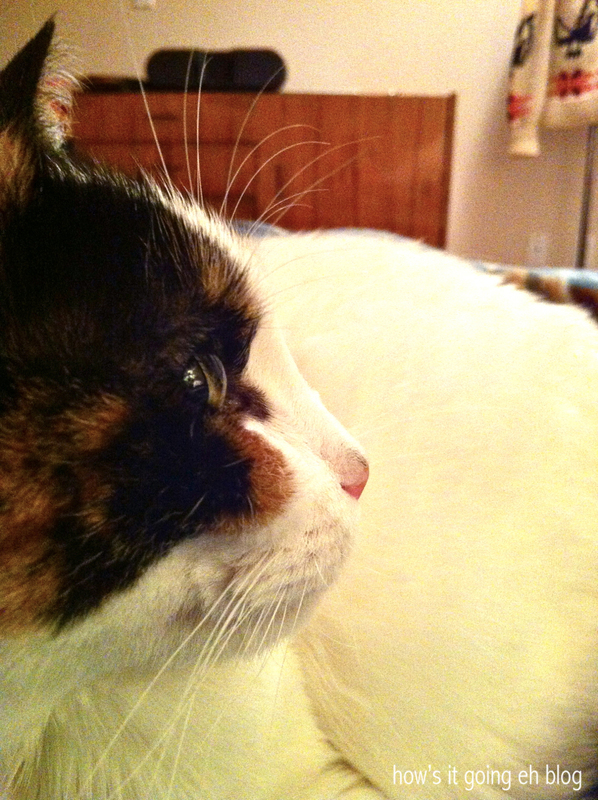 She is such a sweet, well behaved cat….thanks for praying for her mom!!!! Love you! I’m sorry you’re having problems. Our kitty Graybow has bouts where he doesn’t eat. He has a sensitive tummy and so I can’t change his food. He always gets the same kind. The funny thing is, I’ve tried all the most expensive and best foods with him, and the only thing he would eat for forever was a cheap food. Finally got him to eat Iams Sensitive Tummy. Probiotics have also helped him. Thanks, I think the vet is going to put her on some probiotics soon! Megu has a really sensitive stomach too. All her life! How long would Graybow not eat for??? 4 her, thank Jeff 4 allowing her into the bedrm. !!!!! well we here in LALA-land wish her the BEST !!!!!!! Wellllllll……she only ate a couple nibbles. At least she didn’t throw it up like last time! She’s at the doctors’ right now getting more IV fluid. Jeff is the best cat converted dad ever!!! Haha, yes only wild Alaskan salmon for Megu! Oh no! 😦 I hope Megumi-chan feels better soon! Thank you!!!! I appreciate your warm thoughts – Megu has been perking up lately!!!! At least her blood work came back good! What about a urine test? Has she been going to the washroom? Drinking? I’m worried for you! I really hope we can all hear some better news soon! My cats all hate the vet. It really stresses them out way more than its necessary! Hope Megumi is braver than my furry boys. Thanks for the link + your concern, Diana!!! I appreciate it so much! They’ve tested her for everything under the moon!!!! It’s so horrible when the furry babies are in pain! Hi Ania!!!! Poor Megu, she’s always moving around + she’s such a nervous kitty to begin with!!! Thanks for your well wishes – you’re so sweet!!!! Megu Luvs Vintage | how's it going, eh?